An innovative strategy to give forgotten families a path to jobs, affordable homes and school success. Far too many people in our community are chronically unemployed. Too many students fail to graduate high school. Too many families are at risk of homelessness. Thirty-four percent of the 85,055 residents in our area live in poverty. Of the 49,261 residents over 25, 36% did not finish high school and only 25% have a high school diploma. We couldn't address all of these needs without a unified integrated strategy allying our housing, education and workforce strategies with government and community groups. So in 2014, we launched NABE 3.0 to overcome poverty and create opportunity that will guide our work in North Brooklyn in years to come. The NABE 3.0 pilot area is a 15-block section of our target area. 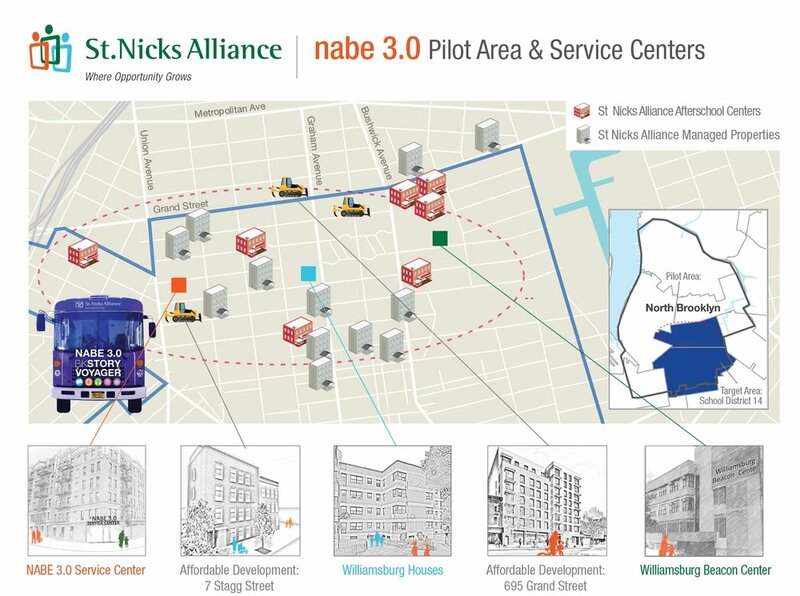 The pilot area is home to 20,854 residents and includes public and affordable housing, public schools and community centers where St. Nicks Alliance has a significant presence and where we plan to build 150 units of affordable housing. Simultaneously, we launched the BK Story Voyager, the flagship of a new literacy immersion strategy that will facilitate reading and deepen our students' connection to school where evidence indicates school under-performance. To achieve these objectives, St. Nicks Alliance serves as a quarterback organization, leveraging its own proven strategies and partnering with key local stakeholders, schools, community organizations and government to create multiple reinforcing strategies combined with intensive support for struggling adults, students and families. Overcoming learning hurdles, landing a job, and finding an affordable apartment can be formidable to struggling families and single adults. NABE 3.0 Transformational Coaches and their support team help neighbors overcome barriers to education advancement, employment, and securing affordable housing. All 500 children in our pilot area programs are ready to learn and eager to read! Children with intensive support: 70% improved in social/emotional learning; 90% improved in attendance; 76% improved in reading levels; 82% improved their report card grades. 14 Skills Training students have been placed with local employers. 22 Adult Education students have made educational progress toward attaining their High School Equivalency Diploma (HSED) and two have secured their HSED. 20 families received intensive homeless prevention support and are no longer at immediate risk.